We were very excited to listen to Popular Woodworking’s Megan Fitzpatrick interviewing Nick Offerman last week. 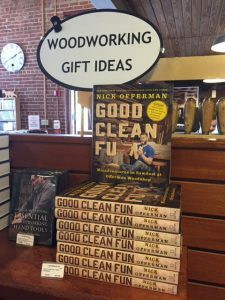 Among the many topics they discussed were Peter Galbert’s mean turkey stew, the similarities between building boats and building acoustic instruments, Nick’s shop in Los Angeles, and of course, his new book: Good Clean Fun, on sale now at Highland Woodworking. And Megan is right – his chuckle is absolutely infectious. Well worth a listen. Not long after the Popular Woodworking article came out, we were excited to receive an in-person visit from Nick at our store in Atlanta. Like many of our visitors, Nick described visiting Highland Woodworking “like being a kid in a candy store” after he took a tour of the store including our woodworking classroom. Thank you for making our day with your visit, Nick. And for representing our craft in such an entertaining way.